I am all confused on my days. Yesterday felt like Monday. Today feels like Tuesday. And if today feels like Tuesday then it also feels like I am missing my first day of work. And that makes me feel a bit anxious. And by bit, I mean real anxious. I keep looking down at my watch, making sure today is Monday. And phew…it is. It is only Monday. That means, tomorrow, I start my new job, and that I haven’t missed my first day. Thank Heavens. My first day. I haven’t had a first day in a long time. I am expecting it to be a bit awkward. A bit nerve racking. A bit humbling. I might get in the way. No, I know I will be in some one’s way at least once tomorrow. You know, when you are standing behind someone, watching over their shoulder, and they forget that you are there, because you normally aren’t and they go to move and ‘BOOM’ they run smack dab into you … Yeah, that is going to happen. It is best to expect it. Then I am ready for it. And then I can giggle about it, instead of feeling silly. Instead of feeling ‘in the way’. What is funny about the whole first day, is that in a few short weeks…it’ll feel like a year. So, tomorrow when I am fumbling over my words or forgetting people’s names…I’ll be thinking and dreaming of the future, when I have fallen into a pattern, when I know, kinda sorta, what I am doing, when I am no longer ‘in the way’. But until then, until I get my first day under my belt, until I know where to stand and where to be and where to park … until then, I’ll just try to feel comfortable until I actually do. Oh, and I’ll be thinking about this here soup that I have packed for lunch. Because, guess what?!? At my new job, I get a lunch break!!!!!!!!! I haven’t had an official lunch break in ages. Lunch breaks are sacred commodities in the pharmacy world. I promise to cherish mine. Forever and ever. A lunch break…crazy stuff! It is the small things. But back to soup. I have had soup on the mind for weeks. A healthy soup to kind of cleanse the soul of all the ultra rich and crazy happenings of the holidays. 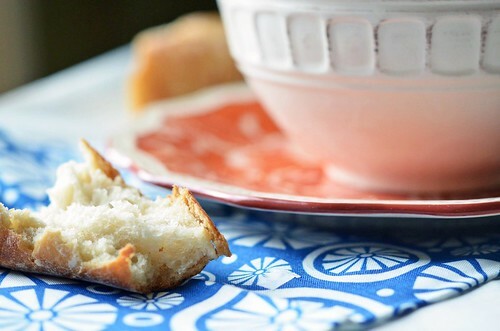 To eat with a side of crunchy bread. To eat while it is snowing outside. To eat in front of the fireplace while watching old movies. To eat while anticipating a first day of work. Ahhh, soup…it does the body good. 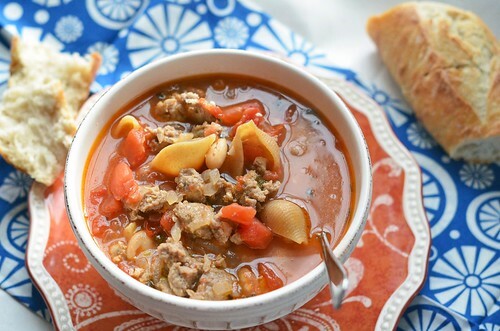 Pasta Fagioli soup is a soup of pasta and beans. I varied a bit from the traditional meatless Italian meal and added turkey sausage and a touch of dairy for creaminess. A meal in a bowl. Oh and before I forget…Let me wish you and yours a Happy New Year! May your 2012 be the best yet! In a large pot/dutch oven warm the olive oil over medium heat. Add turkey sausage, onions, and garlic and cook until sausage is cooked through (about 10 to 15 minutes). Break up the sausage with the back of a wooden spoon. 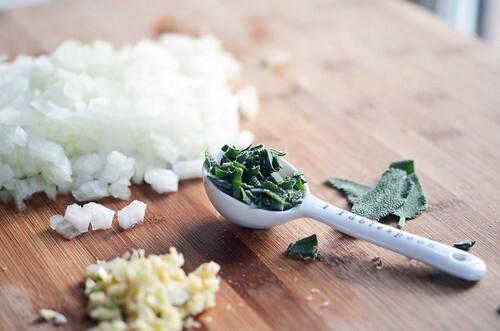 Once the sausage is cooked through, add tomatoes, sage, crushed red pepper flakes, and salt and pepper to taste. Reduce heat to medium/low and simmer (uncovered) for about 15 to 20 minutes, stirring occasionally. Then add cannellini beans and chicken broth and continue to simmer (uncovered) for an additional 30 minutes. 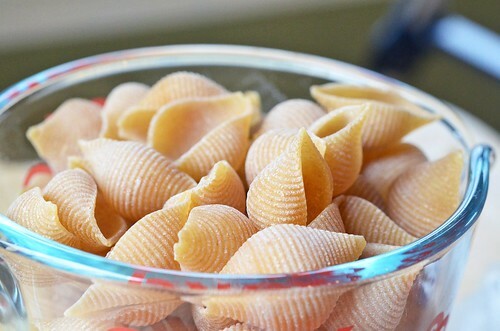 Add dried pasta and cook until pasta is cooked through – about 10 to 12 minutes. Finally, stir in 1/2 cup of Greek yogurt and serve immediately. 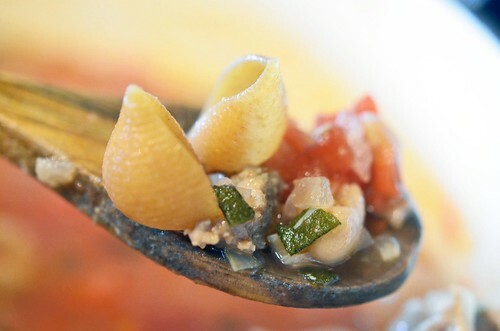 Ladle into soup bowls and garnish with grated Parmesan Cheese and a side of crusty bread. P.S. 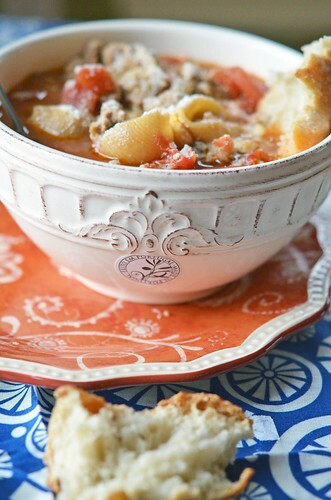 This soup is better the next day!